For other uses, see Voss (disambiguation). Voss (help·info) is a municipality and a traditional district in Hordaland county, Norway. The administrative center of the municipality is the village of Vossevangen. Other villages include Bolstadøyri, Borstrondi, Evanger, Kvitheim, Mjølfjell, Oppheim, Stalheim, and Vinje. The 1,806-square-kilometre (697 sq mi) municipality is the 38th largest by area out of the 422 municipalities in Norway. Voss is the 81st most populous municipality in Norway with a population of 14,514. The municipality's population density is 8.4 inhabitants per square kilometre (22/sq mi) and its population has increased by 5.3% over the last decade. The parish of Voss was established as a municipality on 1 January 1838 (see formannskapsdistrikt). On 1 January 1867, a small area in northern Voss (population: 28) was transferred to the municipality of Hosanger. On 1 January 1868, the northern district of the municipality (population: 2,009) was separated to form the new municipality of Vossestrand. This left 7,592 residents in Voss. On 21 August 1868, an unpopulated area of northern Voss was transferred to Vossestrand. Then, on 1 January 1885, the western district of Voss (population: 2,045) was separated to form the new municipality of Evanger. This left Voss with 5,403 residents. On 1 January 2020, the neighboring municipality of Granvin will be merged into Voss, creating a larger municipality that will also be called Voss. The coat-of-arms is from modern times. They were granted on 8 July 1977. They show a gray deer on a red background. The arms are based on the seal of Peter who was the owner of the farm Finne in Voss, which was one of the largest farms in Western Norway during the Middle Ages. He used a silver deer on a red background as his personal coat-of-arms in 1303. His son also used a deer on his seals as did most of their relatives until 1460. The shape and position of the deer changed between the different persons, but it always was the main figure. 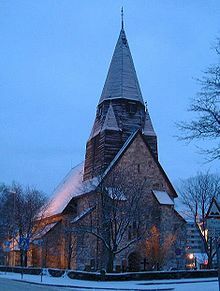 The Church of Norway has six parishes (sokn) within the municipality of Voss. It is part of the Hardanger og Voss deanery in the Diocese of Bjørgvin. Fire in Voss after April 1940 bombing. The Voss church is visible at far left. After the German invasion of Norway on 9 April 1940, Voss was the main point of mobilisation for the Norwegian Army in the west, since the city of Bergen had already fallen on 9 April. From Bergen and from the Hardangerfjord, the Nazis were met with stiff Norwegian resistance. In Hardanger, some of the Germans climbed up the mountains from Ålvik while the rest went through Granvin. To break down this resistance, the town of Voss was bombed by the Luftwaffe on 23 and April 24, and the surrounding countryside on April 25. Nine people lost their lives in the bombing, which completely destroyed the old wood-built town centre. On 26 April, the German forces entered the town, which remained occupied until 8 May 1945. In 1964, the municipality was enlarged with the incorporation of neighbouring municipalities of Vossestrand and Evanger, which had up until then been separate municipalities within the traditional district also known as Voss. All municipalities in Norway, including Voss, are responsible for primary education (through 10th grade), outpatient health services, senior citizen services, unemployment and other social services, zoning, economic development, and municipal roads. The municipality is governed by a municipal council of elected representatives, which in turn elect a mayor. Voss features a subarctic climate. With cold winters and mild summeres. 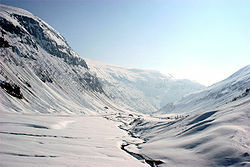 Voss is situated at the innermost part of the Bolstadsfjorden and it includes the valleys that head inland from there. The municipality includes several large lakes: Evangervatnet, Hamlagrøvatnet, Lønavatnet, Oppheimsvatnet, Torfinnsvatnet, and Vangsvatnet. In the north, Voss municipality reaches to the Nærøydalen valley which leads up to the famous Nærøyfjorden. The Stalheimsfossen waterfall near the village of Stalheim sits just above that valley. The Raundalen valley in the east is the main route for the Bergensbanen railway line which connects eastern and western Norway. Farm buildings at the Voss Museum. 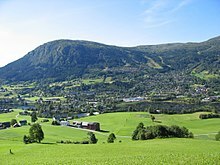 Panoramic view of Voss in early spring. Voss church, built in 1277. Torkild Rieber on the cover page of Time Magazine. Voss is surrounded by snow-capped mountains, forests, lakes and fast-flowing whitewater rivers. This has led to its development as a notable center of skiing, water sports, skydiving, paragliding and other adventure sports. Every year in the last week of June the area hosts the Ekstremsportveko (Extreme Sports Week), which is regarded as the world's premier extreme sports festival. Bømoen, the local airstrip, is home to Skydive Voss, one of the largest dropzones in Norway, as well as a gliding club. The rivers provide various levels of white water, attracting kayaking, rafting and river boarding. Kite surfing and para-bungee may be seen on lake Vangsvatnet. The ski area, to the north of the town, is accessible via a cable car, Hangursbanen. There is also chair lift access from Bavallen, a short distance northeast of Voss. The town's proximity to the Sognefjord and its position between Bergen and Flåm on the scenic railway have made it popular with tourists. One of the sights on the road to Flåm is the waterfall Tvindefossen. The Voss Museum displays several old farmsteads, including a larger-than-life stone statue of Lars O. Kindem. Next to the open-air part, there is a museum with over 20,000 items from traditional farm life. Voss has a wide range of habitats, from high barren mountains to rich fertile valleys. The large areas of coniferous forests provide food and shelter for a host of species, while the many wetland areas are regarded as some of the most interesting birding habitats in the county. There is a bird reserve at Lønaøyane with marked paths and a tower hide. Over 155 species have been seen there. Many are common in Scandinavia, but the area has also produced such unexpected species as the great egret, European hobby, and woodlark. Voss is a winter sports center and has in recent times been the home of many world-class athletes in several winter sports, most prominently biathlon, but also alpine skiing, nordic skiing and freestyle skiing. In all, athletes from Voss have won 6 gold medals, 5 silver medals and 7 bronze medals at winter Olympic games. Athletes from Voss have been present, representing Norway, at every winter Olympic games except one since 1948 Winter Olympics, the exception being 1972. Like the rest of Western Norway, Voss saw large-scale emigration, particularly to the United States, in the 19th and early 20th centuries. ^ Statistisk sentralbyrå (2017). "Table: 06913: Population 1 January and population changes during the calendar year (M)" (in Norwegian). Retrieved 2017-09-09. ^ "Ein ny kommune" (in Norwegian). Retrieved 2017-10-24. ^ Rygh, Oluf (1919). Norske gaardnavne: Nordre Bergenhus amt (in Norwegian) (12 ed.). Kristiania, Norge: W. C. Fabritius & sønners bogtrikkeri. p. 527. ^ "Civic heraldry of Norway - Norske Kommunevåpen". Heraldry of the World. Retrieved 2014-05-19. ^ "Voss, Norway Travel Weather Averages (Weatherbase)". Weatherbase. Retrieved 4 April 2018. ^ Voss, Ekstreme. "Ekstremsportveko". Ekstremsportveko. Retrieved 4 April 2018. Wikimedia Commons has media related to Voss. Wikivoyage has a travel guide for Voss. This page was last edited on 22 March 2019, at 09:30 (UTC).